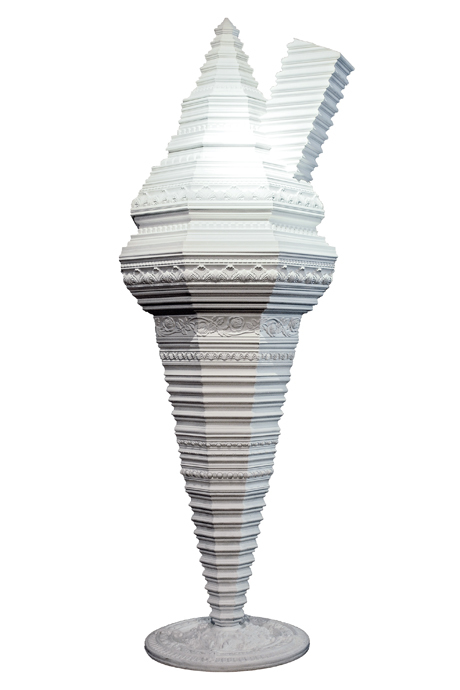 DIY coving, polyurethane facsimiles of ornamental Greek and Roman architectural motifs, are miter cut and assembled in layers to create an oversize rendering of an ice cream cone. Based on the instantly recognizable sidewalk cones that attract trade to vendors and parlors, Long's sculpture utilises the ice cream as a symbol of fun, transience and consumerism, all factors celebrated as virtues by Pop Artists such as Andy Warhol, Tom Wesselmann and Claes Oldenburg. "Both [the ice cream and the coving] are confection of one kind or other, and their dynamic is about the ongoing democratisation of luxury and levelling of high and low culture. Ice Cream Coving speaks of prosperity, happiness and domesticity. Not only do motifs like the egg and dart appear in the moldings, symbolising birth and death, but the flake penetrating the ice cream might also suggest sexual consummation. The whole piece could be read as a fertility totem or an ode to the procreation of the family unit."